aMovement of the postoperative hemidiaphragm was evaluated by fluoroscopic examination of the chest. Abbreviations: R, right; L, left. Source: From Ref. 16. Freehand laparoscopic suturing and intracorporeal knot tying techniques allowed satisfactory airtight suture repair of the diaphragmatic incision in all three cases. open surgery. In such cases, transabdominal laparoscopic adrenalectomy may be a technically difficult undertaking, and the virgin thoracic cavity may represent a reasonable access route to the pathological adrenal gland. Table 2 shows demographic, intraoperative and postoperative data of the three clinical cases performed at the author's institution (16). 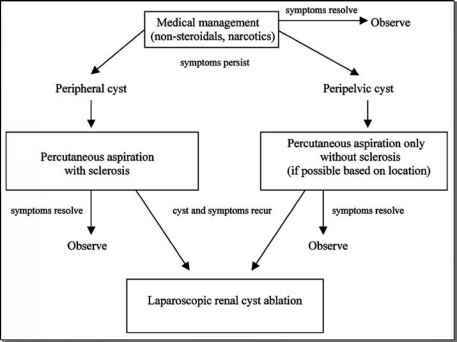 A considerable history of prior transperitoneal and retroperitoneal open surgery was present in all three patients. The initial two cases required a long operating time of 4.5 and 6.5 hours, respectively. However, the third case was completed in 2.5 hours. Blood loss of 150 and 500 cc in the first two cases, respectively decreased to 50 cc in the third case due to increasing confidence with the novel approach. Histology revealed solitary adrenal metastasis in the initial two cases and adrenal myelolipoma in the third case. Malignant adrenal disease and its periadrenal reaction and neovascularity may explain the high intraoperative blood loss in the first two cases. 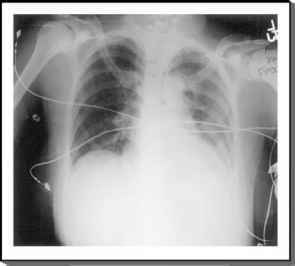 As a result, the authors deemed a chest tube not necessary in the third case (Fig. 7). No clinically significant changes of hemodynamic and capnometric parameters occurred in any case. Postoperatively, the patients were offered fluoroscopic examination of the chest and in the two patients who consented to undergo the test, normal respiratory excursions of the ipsilateral hemidiaphragm were documented. No late complications occurred at a mean follow-up of seven months, and follow-up computerized tomography showed no local recurrence in the adrenal bed in the two patients with adrenal malignancy. A total of five patients have undergone transthoracic transdiaphragmatic adrenalectomy at the Cleveland Clinic from December 1999 to date. FIGURE 7 ■ Postoperative X-ray of case 3. (See Table 2 and text for details.) Source: From Ref. 16.